Alice Crary’s Inside Ethics is a transformative account of moral thought about human beings and animals. We have come to think of human beings and animals as elements of a morally indifferent reality that reveals itself only to neutral or science-based methods. This little-commented-on trend, which shapes the work of moral philosophers and popular ethical writers alike, has pernicious effects, distorting our understanding of the difficulty of moral thinking. Inside Ethics traces the roots of existing views to tendencies in ethics, metaphysics, and philosophy of mind. 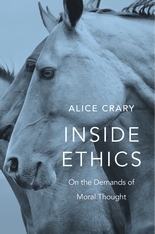 Crary underlines the moral urgency of revisiting our approach in ethics so that, instead of assuming we confront a world that itself places no demands on moral imagination, we treat the exercise of moral imagination as necessary for arriving at an adequate world-guided understanding of human beings and animals. The book’s argument is both rich and practically oriented, integrating ideas from literary authors such as Raymond Carver, J. M. Coetzee, Daniel Keyes, W. G. Sebald, and Leo Tolstoy and bringing them to bear on issues in disability studies and animal studies as well as elsewhere in ethics. The result is a commanding case for a reorientation in ethics that illuminates central challenges of moral thought about human and animal lives, directing attention to important aspects of these lives that are otherwise hidden from view.